SMACWRAP is a unique uncured visco-elastic rubber material that can be cured within the composite to dampen vibration, improve crash safety and flexibility. It is uses in high tech composite sports equipment, race cars, aerospace fuselage panels and space craft for all different types of uses. It can be used to remove the need for secondary vibration damping solutions, and even tune the sounds automotive door panels. Because this visco-elastic rubber is cured within the composite, it acts as a protective net, like Triplex, that holds windscreens together and keeps divers. SMACWRAP is a visco-elastic uncured sheet rubber material that dampens vibration, improves flexibility and crash safety performance, whilst also reducing weight and cost in certain situations. It comes in rolls of 60 mm and 600 mm width, various thicknesses starting at 0.2 mm and is black in appearance which suits its application in composites, especially with carbon fibre. 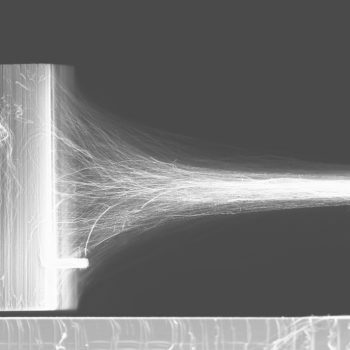 A visco-elastic material is a material that exhibits both viscous and elastic properties, i.e like water it resists shear flow linearly over time when stress is applied, but at the same time like a spring, it has the ability to return back to its original state once the stress is removed. This offers a unique combination properties that make the material strain-rate-dependent. In other words, the material reacts different dependent on the velocity of stress applied to it. This gives SMACWRAP a selection of properties that lend themselves to a variety of situations. And as a company that processes this material for end users, we have the advantage of understanding the use case for SMACWRAP both from a theoretical and manufacturing perspective. The purpose of this section is to provide some ‘on hand’ experience with materials, so that designers can use it to their advantage when designing for manufacture to create better products. If you’d like to discuss any of the points raised below any further, we’d be happy to offer further advice to help find the right processing method and materials for your project. Click here, if you’d to get in contact. The first notable feature is, SMACWRAP’s ability to expand during the curing process. This can be a real advantage when processing components that need that extra surface pressure and consolidation. Especially on complex parts with particularly tight radii or that have issues with pinhole. This intensifying effect is most effective using the skin damping principle and it can be used as a localised intensifier. SMACWRAP has a tendency to stick to itself in its uncured state, when it is folded or comes into contact with itself without the poly liner protection. This is something to considered when providing kits for manufacture. SMACWRAP actually bonds to the composite, unlike other rubbers that are self-releasing. 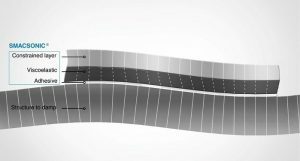 This means that the constraining layers can be laminated as a continuous layer without the need for spacing SMACWRAP in the composite. See figure 2 for a typical layup, using the skin damping principle. However, it is advisable to introduce breaks in the SMACWRAP layer to provide some rigid anchor points for holding the constringing layer down if the component will be subjected to extreme conditions. SMACWRAP helps the composite conform into the mould shape. Having a soft visco-elastic layer in the composite allows the composite to flex in and out of the mould shape, which can be very useful for tight corners or undulating surfaces. However, it should be mention that this may not always produce a uniform thickness of SMACWRAP in the composite, due to varying compression. Despite the incredible advantages of high strength, high modulus composite materials, one very real issue for composite designers is NVH (Noise Vibration Harshness), which needs to be considered when designing for the end user’s comfort. Or even, designing for the avoidance of natural frequency, to ensure the mechanical integrity of components are maintained through their service life. SMACWRAP is a sheet rubber material that can be strategically positioned in the layup of the composite, to reduce vibration by up to 3 times. Below shows the vibration results of a composite sports car hood at different frequencies with and without SMACWRAP in the layup. Figure 1: Shows the damping effect of a sports car hood with and without SMACWRAP in the laminate. One of the best uses of SMACWRAP is as a skin damping solution where the structural element of the composite lay up is prepared, SMACWRAP is then laminated on top and a constraining ‘skin’ layer of composite material is laminated on top. 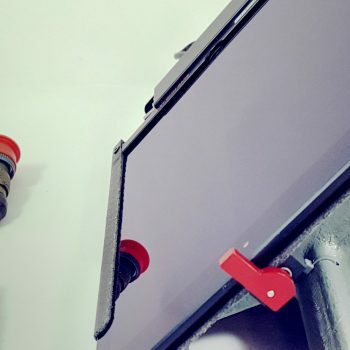 This is an incredibly efficient and useful way of providing surface damping for a composite component and can be incredibly effective if addition components are mounted onto this surface or if this is a contact area for the user. Figure 2: Above show an example of a skin damping laminate. Often in situations where secondary damping is needed, like automotive or aerospace fuselage panels SMACWRAP can be integrated into the bodywork to reduce or completely remove the need 3 vibration damping structure. This can, not only reduce the resulting mass of the overall product, but also the cost of materials and install of the secondary dampening system. Inserting several layers of SMACWRAP into a composite lay-up can provided a significant degree of flexibility, which does has its own caveats. However, this can be used to the designer’s advantage by increasing the level of functionality of a component, providing localised flexibility both through torsion or bending. Vibration damping is not only a mechanical advantage, but also an audible factor to consider. 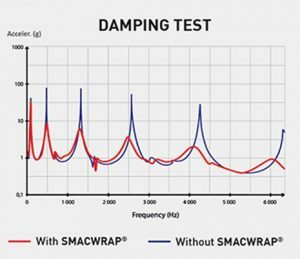 Sound waves are a function of the material that they oscillate from and SMACWRAP has been used by automotive engineers to tweak/alter sounds emitted by composite panels to give them a more luxurious feel. This can also be used for enhancing the properties of the composite, not only for comfort, but also real saleable and emotive purposes. If you’d like any more information on how we use SMACWRAP, or if you’d like to use it in one of your future projects. Whether you’re a new or existing customer, give us a call and we’d be happy to help you find the best materials and processing method for your application. Click here to get in contact.